Paperback, with flaps, 368 pages, 13.5 x 20.6 cm, 5.3 x 8.1 in. Henrik Falkner hardly knows what's happening to him when he first sets foot in the picturesque alleyways in the old part of Lisbon. The one-time policeman is to claim a mystifying inheritance: his uncle has left him a house plus an antiques shop. 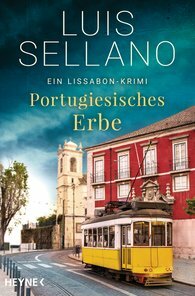 As Henrik becomes increasingly caught up in the pulsating city on the Tejo, he discovers that his uncle has to all appearances spent years collecting objects that are all linked to unsolved crimes. And no sooner has Henrik enjoyed his first pastéis de nata than someone tries to kill him. Henrik plunges into a case that is to change his life. For readers of Jean-Luc Bannalec and Sophie Bonnet. "A gripping, superbly told story convincing in particular through its atmosphere. Never has it been more suspenseful to experience the pulsating life of this fascinating city."